Wishing you all good fortune in 2016! I am starting the new year with a new brand on my blog that has been quite popular and luckily I got to review their best-seller product. The product is Palmer's Skin Therapy Oil based on Cocoa Butter Formula. The revolutionary brand Palmer’s Cocoa Butter Formula was created and introduced to the world under the ownership of E.T. Browne Drug Company, headquartered in New Jersey for over 50 years. Since that time Palmer’s has expanded on its vast knowledge and heritage, developing brand ranges such as Skin Success, Shea Butter Formula, Olive Butter Formula, Coconut Oil Formula, Olive Oil Formula and Hair Success. Palmer’s has a global presence; available in over 80 countries offering the #1 Cocoa Butter brand in the world. Palmer's Cocoa Butter Formula Skin Therapy Oil is an advanced multi-purpose skin perfection product that can be used all over the body. This preservative-free, lightweight formula contains an exclusive blend of key ingredients formulated to help improve the appearance of scars, stretch marks, dry, damaged skin, uneven skin tone, aging skin and fine lines and wrinkles. Skin looks and feels instantly soft and smooth with this unique, non-greasy, non-staining formula. Canola Oil: helps even skin tone by targeting marks and spots while moisturizing for and conditioning the skin. Sesame Oil: moisturizes deeply to improve skin's moisture levels leaving it looking more hydrated, firmer and more plump. Cetesomate-E: helps improve the appearance of scars, stretch marks, dry, damaged skin, uneven skin tone, aging skin and fine lines and wrinkles. Rosehip Oil: contains essential fatty acids, Vitamin C and Vitamin A to promote healthy skin cell rejuvenation. Actually I had won a bottle of Palmer's Skin Therapy oil (Rosehip fragrace) in a contest almost a month ago and had been enjoying using it since the day cold wave hit the town and my terribly dry skin wanted some special care. When I received another variant of Skin Therapy oil from the brand for review, I had very clear impression on my mind what I have been experiencing with the oil since these days. To begin with, the Cocoa Butter Formula Skin Therapy Oil is a pale yellow color oil that looks colorless on your palm. It is packed in a transparent bottle made of good quality plastic. A tight flip-open cap retains the oil within the pack and gives you a leak proof pack to be carried anywhere without any trouble. The bottle is labelled with all the details that we need to refer except the price. But we may find the price label on the outer cardboard carton. The consistency of the oil is slightly runny than usual oils so we need to be careful while pouring it on our palm to use. I wish it was in a pump dispenser packaging to make it easier to handle. 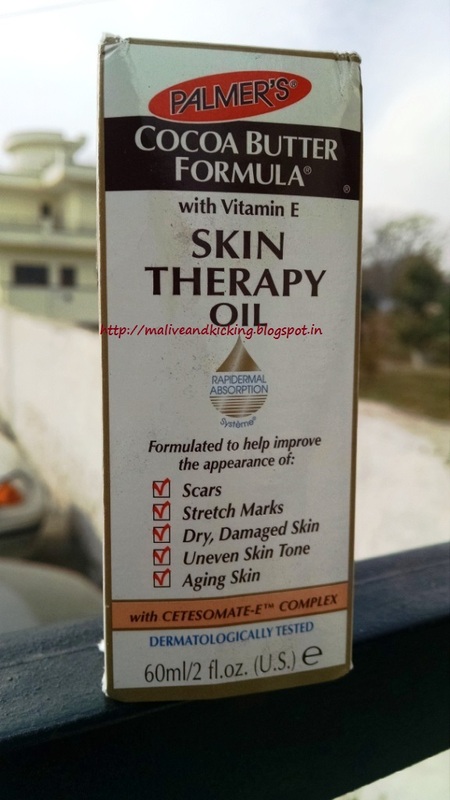 Since the product is named 'skin therapy oil', I truly had high expectations of its performance. 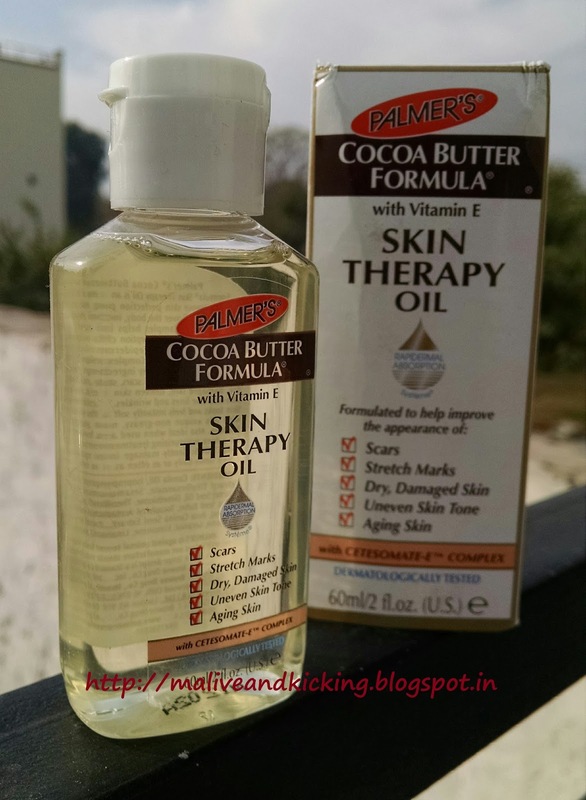 The Palmer's Cocoa Butter formula skin therapy oil is quite light on skin and stands its claim to be non-greasy. 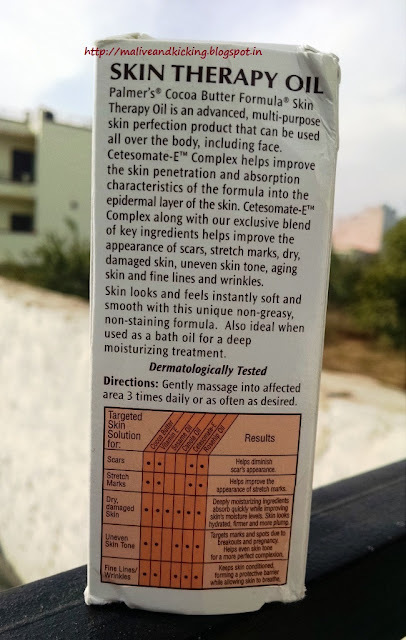 There is no sticky feel on skin due to its excellent absorbency within no time, My dry skin literally drinks the oil, but the good thing about this oil is that you need very less quantity at a time. The hydrating capability of canola oil and cocoa butter makes it perfect to provide needed moisture to skin. The skin instantly turns smooth-to-touch on top layer and moist from deep inside. I have no major scar marks on my skin, but I definitely wanted to work on my uneven skin specially on the rougher body parts likes elbow, knuckles, around the ankles etc. Over these past weeks, I have been applying this oil after shower as my skin is more receptive for the goodness of oil that time. And these parts have become softer showing considerable improvement in skin texture. There have been instances when my skin starts showing flaky patches and then I need to give myself a light massage at any time of the day. And honestly, it may happen to me in any season :/ So this oil is one of the perfect option because it doesn't leave stains on my clothes or bedcover, if applied mid day. The brand suggests that the oil to be used not only on body, but also on face, if needed. Despite having dry skin, I have never given myself facial massage entirely with an oil till date. But a dip in this oil and rubbing in here n there to cover up dryness is only tried by me. (Do tell me about the effects if anyone had used it on face).. The product may seem priced higher at INR 670 for 60ml, but performance n quality of superior ingredients win the race for sure. Has efficacy of cocoa butter, Vit. E, Canola Oil, Sesame Oil. Light on skin & Non-greasy. 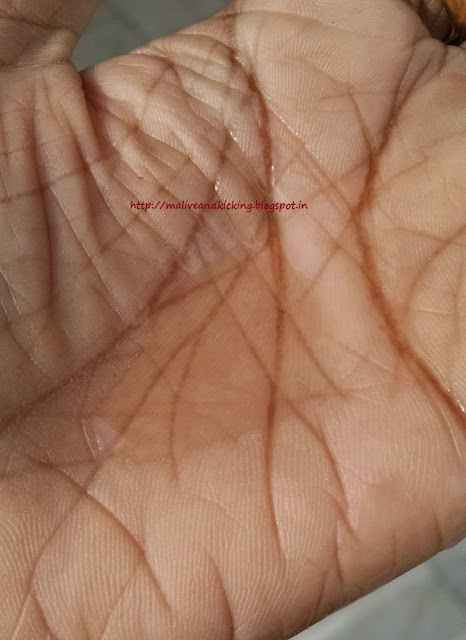 Causes no itching, inflammation etc. Wish the packaging be in a pump dispenser. 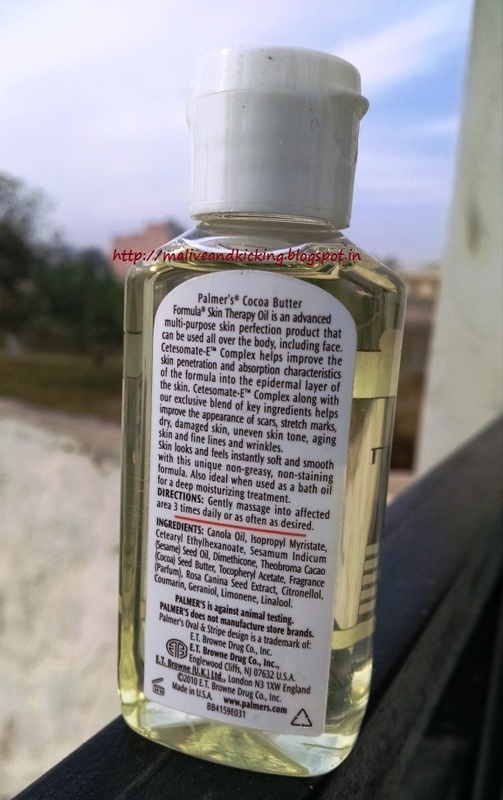 The Palmer's Skin Therapy Oil (Cocoa Butter Formula) is an exclusive blend of many deep hydrating ingredients that work to bring your skin to baby-soft texture if used over a period of time.I am yet to assess if it may work on signs of ageing, as I didn't try it on entire face. But definitely its wont' be an overstatement to call it skin perfection product!! not exactly miracle, but works when used generously. The product seems good but bit pricy . thats true, but gives results par excellence. That was a very detailed review, Glad it lived up to your expectation. I'll surely try this one out. Looks good for winters... Does it help in stretch marks? It should be named as Miracle Oil. u can call it so..
Great product for winters. You mentioned that your skin tone is uneven on elbows, knees etc., but these areas are dark for everybody. If you feel uncomfortable use lemon juice it will give added beneifts along with this oil. lemon juice makes my skin more dry, bt I do use it occasionally. I have scarring on my legs from ingrown hair. Will try this. Hope it works.